Matters of the presence of the past — haunting presences. A couple of editions of Walter Scott’s poetry have arrived from my favorite bookseller – Barter Books of Alnwick, Northumberland UK. The first is an 1866 edition of Scott’s poem, Marmion, about the days before the disaster of Flodden Field in 1513. It is illustrated with tipped-in photographs (collodion plates, albumen prints) by Thomas Annan, the great Glasgow-based pioneer of documentary photography. Though quite evocative, mainly through the faded pasted-in print, Annan’s photographs are merely of a few settings mentioned in the poem. They add presence certainly, but do not attempt to illustrate the narrative. Photography fails here to connect with the text in any but a superficial way. I will post some more thoughts on this later. With it came the twelve volumes of the Turner edition of the collected poetical works of Scott. What I wasn’t expecting was that they’re haunted by the ghost of an infamous figure from the twentieth century. To explain, I need to start somewhat earlier. 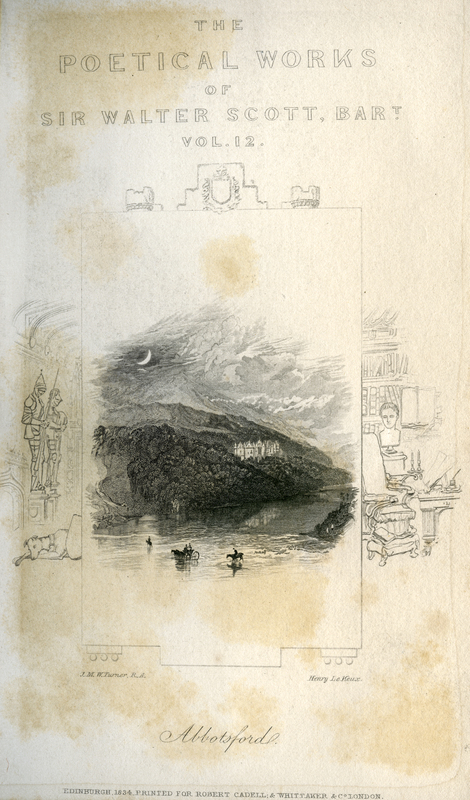 J.M.W.Turner visited Scotland in 1831 to sketch in the field and prepare illustrations for Robert Cadell’s collected works of Scott, intended to be the definitive edition. Publication of the poetry came in 1833-4, after Scott’s death, with Cadell paying off Scott’s debts in return for the copyright on his work. Gerald Finley, in his Landscapes of Memory (1980), outlines the consultation between the three of them over the plates, engravings made from Turner’s watercolors and drawings; their visits and conversations produced fascinating counterpoint between the images and the text, quite different to Annan’s photographs. I have long sought a copy of the Turner edition of Scott: the engravings, a frontispiece and title page in each of the twelve volumes, are extraordinarily fine in a way that reproduction does not witness, and while the text is, of course, freely available online, nothing can substitute for handling the books themselves, especially, I find, in the small pocket size of 6 1/2 x 4 inches, which is such a pleasing compact form. And the books themselves connect us with times and readers past. The particular set that arrived this week has prompted some haunting insights. The books belonged to Douglas, First Earl Haig of Bemersyde, Field Marshal, Commander-in-Chief of the British Expeditionary Force in the First World War. Douglas Haig was not born to be the Laird of Haig, Clan Chief. His father was manager of Haig and Haig whisky distillers, and lived a middle-class life in Edinburgh. The line of Haig dates back to before the twelfth century. A charter signed in 1162 to Dryburgh Abbey bears the name ‘Petrus de Haga, proprietor of the lands and barony of Bemersyde’, but the direct line from Petrus had died out in the nineteenth century. 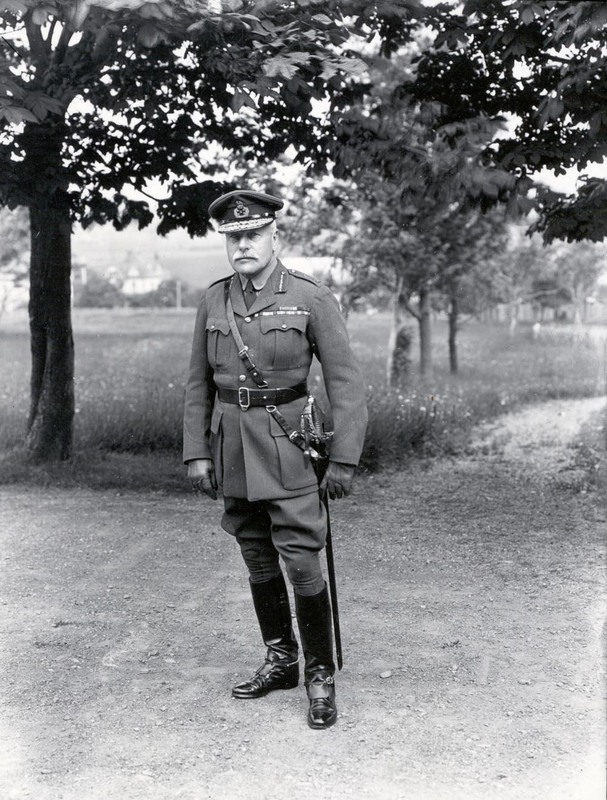 Douglas Haig became Earl Haig in 1919 when the title was created for him in recognition of his service in the war. 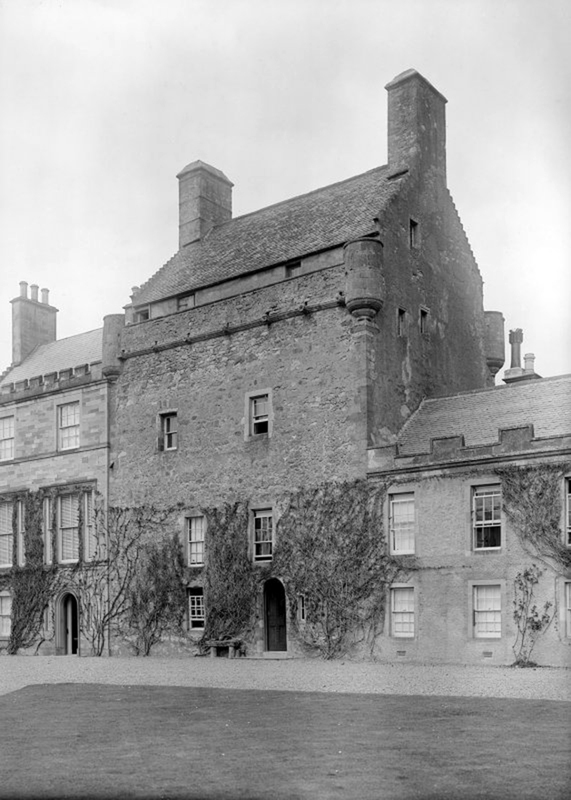 He was presented with the old clan estate of Bemersyde through a public subscription after his cousin, Alexander Balfour Haig, put it on the market in 1921. Haig received a popular state funeral in 1928. But by the 1960s his reputation was under vigorous challenge: it was argued that “Butcher Haig”, commander of the largest field army ever assembled by Britain, had sent hundreds of thousands to their deaths at the likes of the Somme and Passchendaele under what has come to be seen by many as a dogmatic and old-fashioned strategic mentality concerned to achieve decisive battlefield victory at any cost. The actor John Mills played Haig in the 1969 movie version of the satirical musical “Oh! What a Lovely War” – in the last scene he is shown walking among the countless white crosses of the dead in one of the many graveyards left in Flanders. Let me return to the books, because I am taken by the way the past returns, as presence, to haunt. 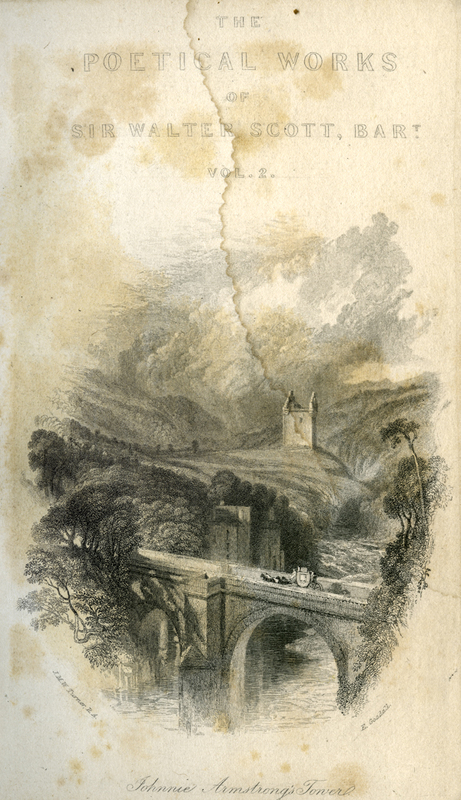 Turner’s engravings are neither illustrative of characters and events in Scott’s poems, nor simply decorative, as is typical in other illustrated editions. Instead, they offer commentary on the mode of historic presence to be found in Scott’s poetry. Scott, in his edited versions of old ballads and in his own verse, offers literary re-creation of the atmosphere, the ambiance of the past, which he called “manners” (I have commented elsewhere that this is what academics now sometimes call habitus). Turner offers the reader atmospheric landscapes, more sublime and awe-inspiring than homely and picturesque, featuring the houses, castles and towns of Scott’s historic worlds, and sometimes with figures in the land. The past persists in these landscapes, but is in an awkward relationship with the living. The dark scenes are emotionally quite remote — not of a human scale and frequently showing nature in a drama of its own making. As Gerald Finley proposes, Turner amplifies historic presence through the relationships he establishes between the tiny figures which populate his ancient architectures and landforms. The architectural remains are placed either in the deep middle ground or in the distance, while figures, on the other hand, usually occupy the foreground or near middle ground. The buildings are always remote from the figures. There is often an emotional distance too when figures appear unaware or indifferent to their environment, merely passing through or focused on immediate tasks at hand. Johnny Armstrong’s Tower in Volume 2, for example, appears in the background above a chasm, while a coach speeds away over a bridge. Turner is exploring actuality in these images, the conjunction of past and present (and a key component of the archaeological imagination). As in his work generally, he is concerned with how a graphical medium such as paint or engraving relates to experiences of place. The brooding highland landscapes and, above all in this set, the pairing of Loch Coruisk in the Cuillins on Skye with Fingal’s Cave on the Isle of Staffa, are tours de force of descriptive experiment. 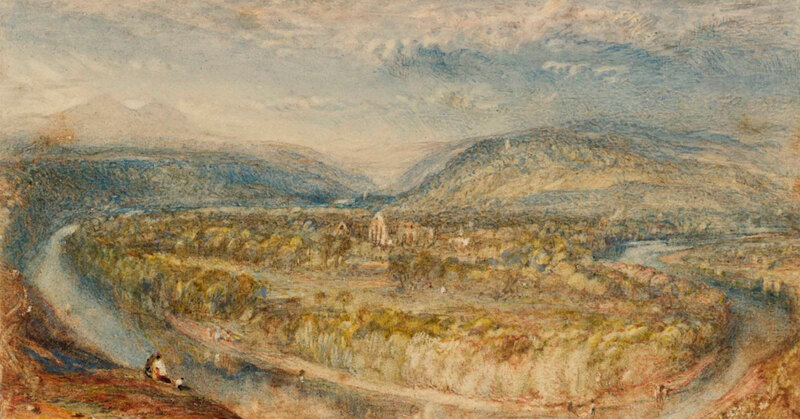 It is appropriate therefore that Turner makes explicit visual references to his preparatory visits around Scotland in 1831 with Scott and Cadell. Scott was to die the next year (I have written about one of his final excursions, to Italy, in my book The Archaeological Imagination). 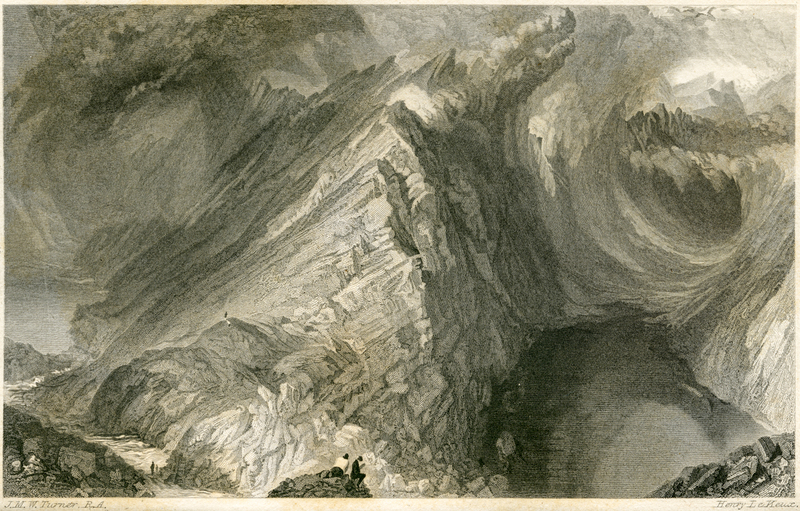 Turner knew that Scott was coming to the end of his life and clearly intends to commemorate that life and poetic achievement in the engravings. Turner was also, we know, very concerned with his own mortality. 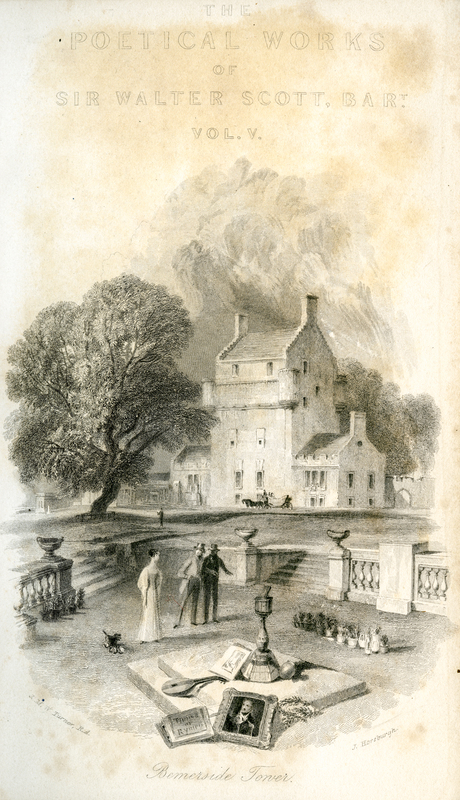 The title page to Volume 1 is of Smailholme Tower, Scott’s childhood home. 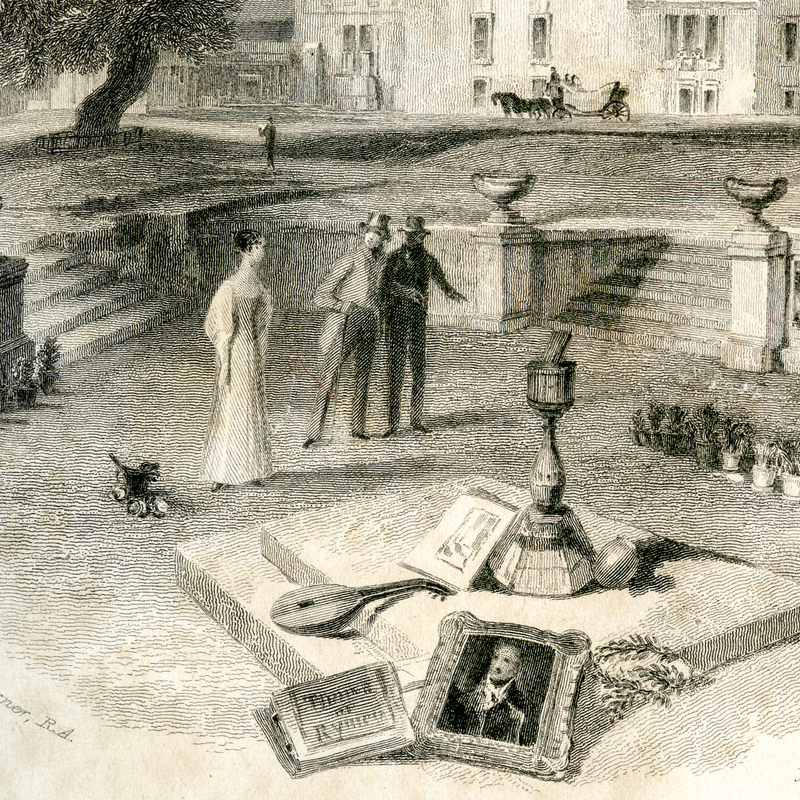 The vignette in Volume 12, the last, has an architectural surround in the style of traditional emblematic frontispieces and title pages: the picture of Scott’s last home Abbotsford is treated as if it is set into a commemorative funerary plaque or tablet. The house was to become a memorial to Scott, and not just because he lived there, but because he designed the architecture and interiors to reflect his interests. 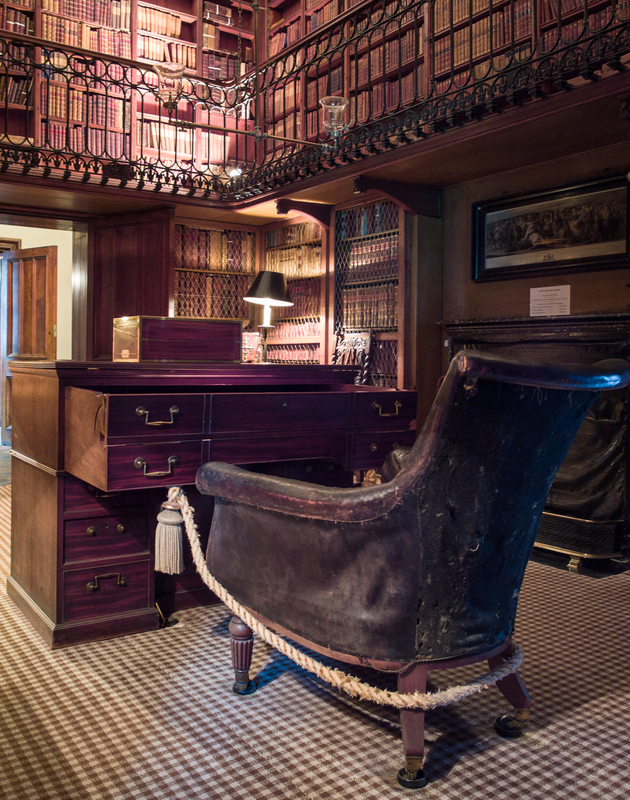 The surround of the vignette offers glimpses of Scott’s inner world: the armory, his collection of archaeological memorabilia, with a sleeping dog, and the study, with desk and empty chair. A visit to Abbotsford today still features prominently these very encounters. Scott haunts the house. His works are intense personal explorations of a particular and centuries old mode of expressing historical agency and experience: you can still hear his voice. 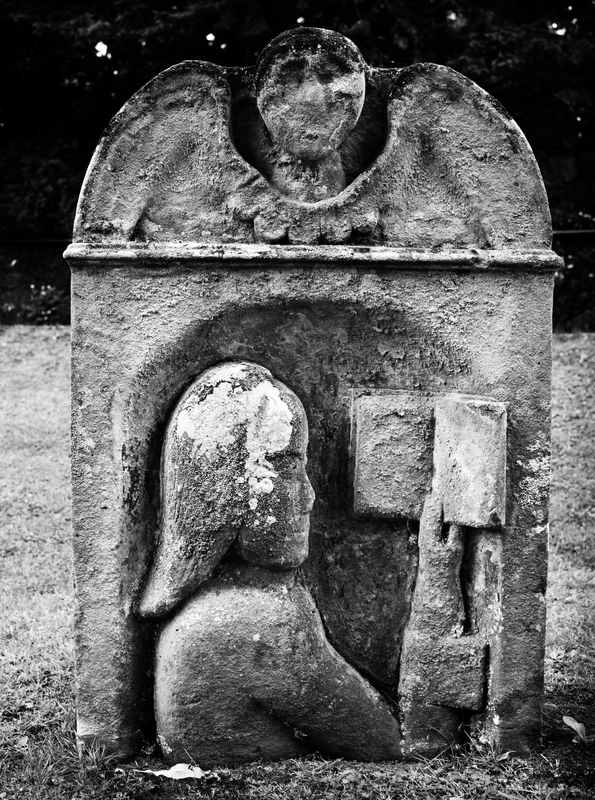 Scott was buried at Dryburgh Abbey; it was his distant family connection to the Haigs that let him be buried there. 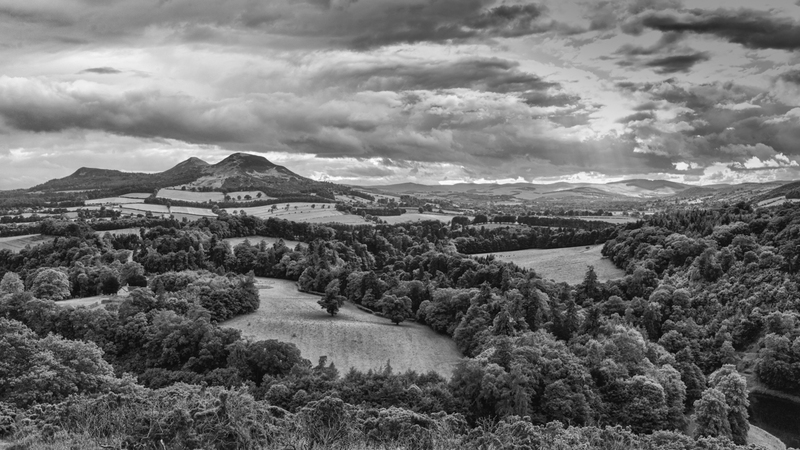 Lockhart, his nephew and biographer, describes the funeral cortège making its way from Abbotsford and stopping for a few moments at a viewpoint, a favorite of Scott’s, looking back over a bend in the River Tweed to his home and the Eildon Hills. Ever since then this has been known as Scott’s View. It is on the hill of Bemersyde, with the old house just behind the road and the picturesque view across the valley. 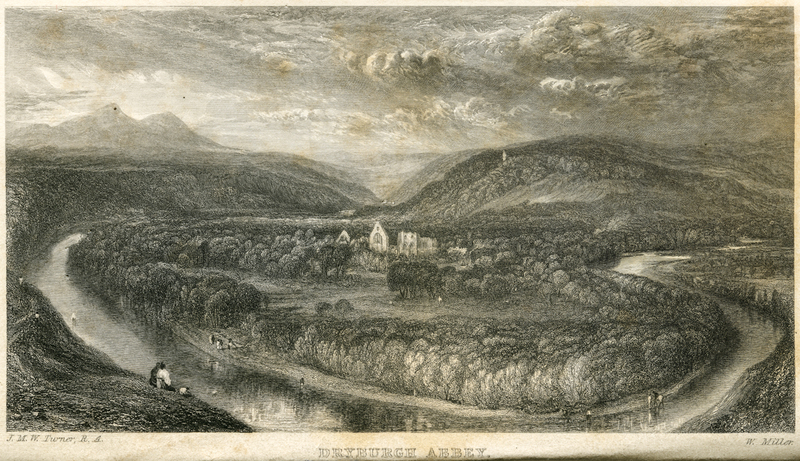 Turner pairs a view of Dryburgh Abbey with a vignette of Bemersyde in Volume 5 of the Poetic Works. This is the pivotal illustration in the set. In the foreground Scott and Cadell accompany Miss Mary Haig, the daughter of the Laird of Bemerside (as it is spelled in the vignette). In front of them, and arranged around a sundial, are a spilled urn, a sketch book (or a book of engravings? ), a lute, a portrait of Scott resting on laurel branches, and a manuscript titled Thomas the Rhymer. This is Thomas of Erceldoune, the thirteenth-century bard whose romance of Sir Tristram, edited by Scott, is presented in the volume. Scott and Cadell seem a little distracted by a row of potted flowers. A coach stands waiting at the door of the house. Turner is in the middle ground drawing the massive old Spanish Chestnut. This is but a visit; it is time to leave. Mary is the last of the line of the Haigs. We are mortal, though there is recompense in the creative efforts of the artist (painter or poet), perhaps also in the pleasures of a garden. And the land and its buildings endure. This image comes at the beginning of Scott’s edition of the medieval verse of Thomas the Rhymer. There is another reference here to a collection of verse that inaugurated the efforts of literary antiquarians like Scott. In 1765 Thomas Percy published his Reliques of Ancient English Poetry, a collection of medieval ballads. 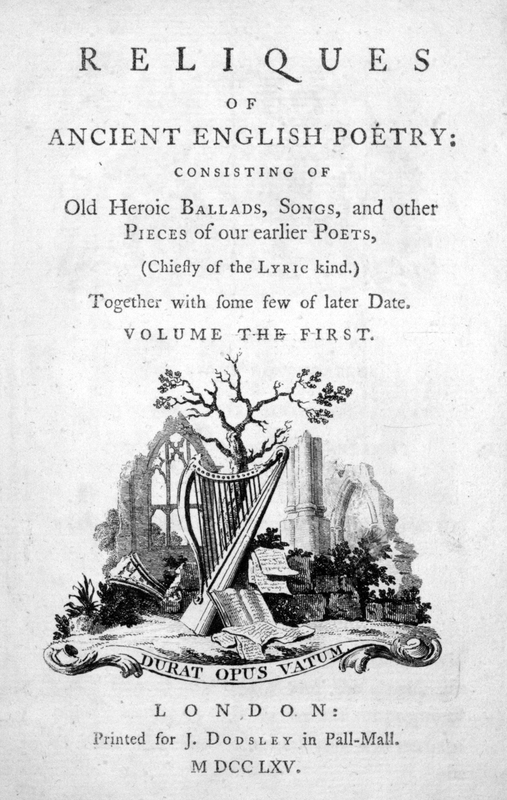 Percy’s title page showed a poet’s lyre propped against a blasted and dead tree amidst the ruins of an abbey, with the motto “Opus Durat Vatum” – It is the work of poets, our prophets, that survives. It was this same Thomas the Rhymer who reputedly said of the Haigs in prophesy that “Tyde what may whate’er betyde, Haig shall be Haig of Bemersyde” — “Come what may, the Haigs shall always be at Bemersyde”. And Haig’s bookplate carries that motto “Tyde what may”. He was buried at Dryburgh Abbey next to Scott. These antiquarian sentiments of mortality and descent have become cliché. The symbolism of the image of Bemersyde is overdone, perhaps indicating a touch of humor, just as Scott can quite deliberately become satirical and self-mocking by overdoing explanatory notes and citation in offering the poems historical and scholarly context. But the self conscious emphasis upon the process of authentically engaging with the past that we find in both Scott and Turner, and the extraordinary atmosphere of the engravings are still fresh today. 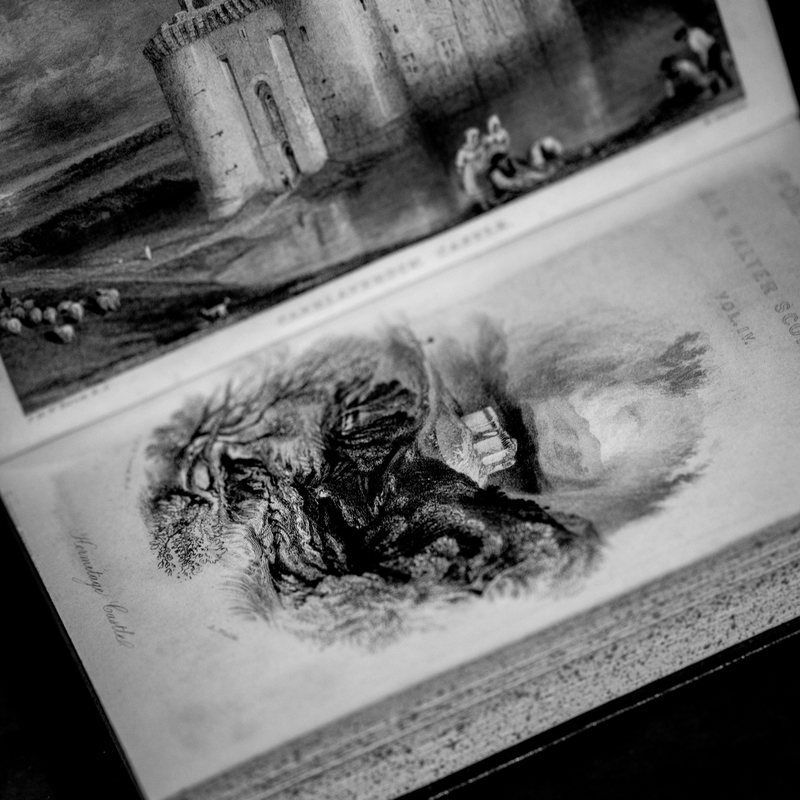 Scott and Turner anticipate the persistence of pasts into the future, transformed, mediated, displaced in the portrait, sketchbook, manuscript, old urn and house. Now this particular set of 12 books has brought all this and more, after other forgotten journeys, to California. It is almost as if Turner anticipated something like this! Scott, Turner, Cadell are here. As is the Field Marshal, who thumbed these pages (the bindings are still tight and there are few signs of wear). Haig in history and at Bemersyde; Scott, Cadell and Turner touring together in 1831; antiquarian landscapes of the Scottish borders and beyond: all are brought together in California through the medium of the book as artifact. Such presence, or aura, is interstitial – found in the gaps between events, places visited, buildings and lands built and worked, people’s thoughts and deeds, the writings and works left behind to follow their own course. Presence is here relational, dialectical. Is this not indeed the way the past, in its viral remains, infects us? Is it a coincidence that Haig owned this Turner edition of Scott? Embodied are those pivotal connections between past and present so vital to Scott at nearby Abbotsford, to the Haigs at Bemersyde, of which this Haig founded a new line, and both at Dryburgh. All share a concern with history as stage, and upon which the soldier Haig performed. The connection with Scott clearly meant something to Haig – he was buried alongside him. So why did the family sell the books? Why are they not still at Bemersyde? a past all too present? I am grateful to you for posting this information. It is indeed sad that these books have left Bemersyde and should you ever wish to part with them, or visit Bemersyde please do get in touch.